You mean, someone literally cooks in this particular alley-(the pic was taken too far away for me to analyze/discern all that well). Does this mean someone actually cooks in this alley on a frequent basis; are they barbecuing, or what’s going on? (Very curious now, because the phrase is so vague-wish I could tell). Also, what part of the US/world is this taking place? Unusual! Looks like the fire escape of an apartment/home/other building, because I notice steps. Very interesting & mysterious! Difficult to cook at night, needless to say. You’ve never been camping!!? Smell the fire! Cook among the wood cinders! Or sat in the dark with somebody! Or try walking around a Tank Compound in Germany “on guard” at two in the morning! It’s near someone’s place of residence, it appears where someone cooked; it’s not out in the countryside with tents. It wouldn’t be unusual if the people had tents, but it’s not like that. It doesn’t look like anyone’s around. It looks like there is someone who could be cooking if you zoom in on the picture. To the right of the stairs you see two windows, a guy in a long-sleeve black shirt standing by a… sink? Maybe there is someone really cooking there. The photo was taking from too far away. I guess it doesn’t matter much if you spill a little sauce on the floor! Why do pictures like this look so peaceful to me? It does look clean for an alley. Do the residents look after it. It’s the cleansed alley that I have ever seen.. I adore stories that occur in alleyways. Nonetheless, I can’t discern a cook or cooking going on. I liked the contrasts of dark and light. It reflects the concept of alley. The only thing missing is the cats. Right. It definitely needs some cats. At least if they want to have a barbecue, why don’t they eat outside during the day, but there’s barely any light at all. 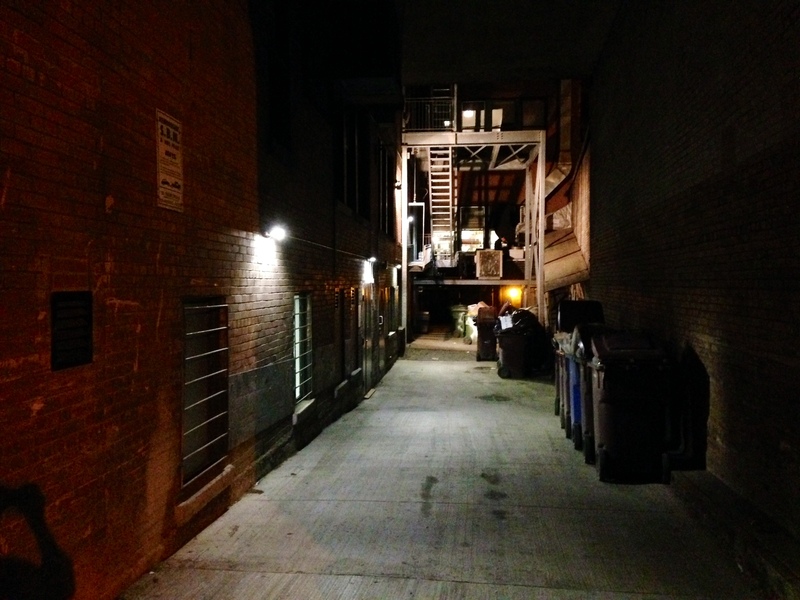 The alley does look like it’s nice & clean, which is really out of the ordinary. Where is everyone? The cookout must be over. Wish I could see some people moving about. Lovely use of perspective and composition in directing the viewer’s eye. In particular, I enjoy the repetition in the Chef and the pile of debris directly below, as well as the gritty texture found throughout. Fantastic storytelling! I sometimes will make my pictures black and white…and then realize that they are actually better in color. But in this case…I think you would be correct! Beautiful picture though!! cool-ness ! cooking my forte besides the music ! It doesn’t look like there’s much room to barbecue/eat outdoors. A very small space, although like I said before, unusually clean. They could cook whatever food they want to eat indoors on a George Foreman grill & bring it outside & eat it; that might be an easier way of going about it, since it’s a very narrow little area. Reblogged this on DELTA 94. It doesn’t look like there’s room to cook outside, then eat afterwards. It is alley spider man is likely to emerge! !